Save your search - find out immediately when "Henry Kallem" is available at auction! Henry Kallem (American, 1912-1985) House with a Red Tree. 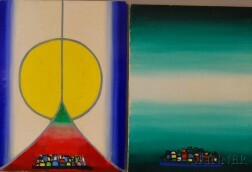 Henry Kallem (American, 1912-1985) Chinese Scroll / A Geometric Triptych.